Where are the Highlands of Scotland seems at first an easy question to answer. But it is really a two part question: where are the Highlands in terms of their geography – but also in a cultural sense. Of the two parts, the geography or geology part is the more straightforward. Take a look at the sketch map further down the page. 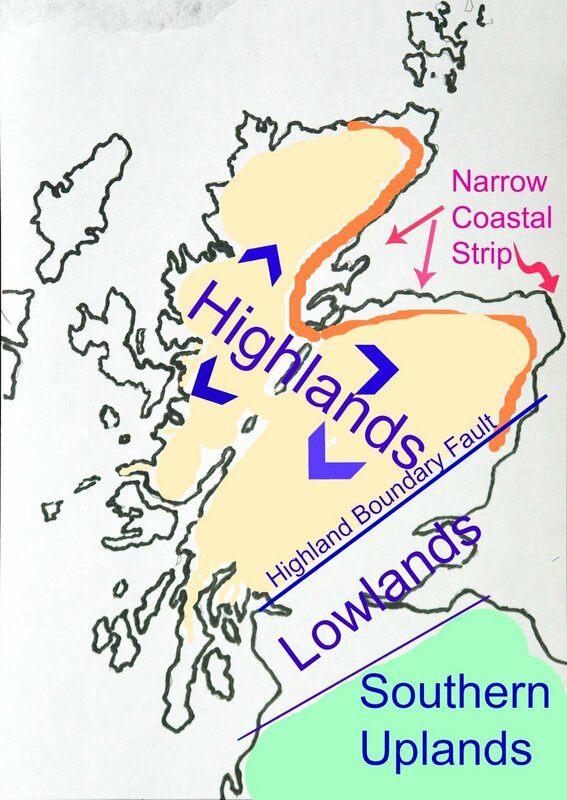 Separating the Highlands from the more populous central belt of Scotland, the Highland Boundary Fault runs south-west/north-east across Scotland. It reaches the North Sea at the pleasant little town of Stonehaven, well within the city of Aberdeen commuting belt. Its other mainland town extremity is at Helensburgh, like Stonehaven a commuting kind of place but this time for Glasgow, Scotland’s largest city. Follow that Highland Boundary Fault! The Highland Boundary Fault defines the Highlands in a way - except for the coastal strip with its farmlands and a rich form of the Lowland Scots tongue as well, especially from Aberdeen and round the Moray Firth. In the photograph below, taken from the Three Lochs Way, just above Helensburgh, looking south-west, the fault line is in the dip in the middle distance, left of centre. That's the Rosneath Peninsula, on the far bank of the Gareloch, with a bend in the widening Clyde estuary in line with the fault line. East of Helensburgh, the straight-ish fault line runs through the islands of Loch Lomond, through Conic Hill behind Balmaha and off to the north-east via the Menteith Hills at Aberfoyle. On goes the fault line up through Strathearn, via the handsome wee town (or big village) of Comrie in Perthshire. An interesting aside here is that Comrie is sometimes called the ‘Earthquake Centre of Scotland’ or ‘The Shakkin Toon’ (shaking town) because they get more tremors here than anywhere else in Scotland – simply by its very close proximity to the Highland Boundary Fault. The town in the picture here, middle-distance right, is Crieff, east of Comrie. Looking north across the Highland Boundary Fault with Glen Turret and Ben Chonzie (white hilltop left-ish above green barn). Summit of Ben Chonzie, still looking north. Into the Highlands now. Wait, above (I hear you say) we were talking earthquakes in Scotland? Now, it must be said there are very few and also very, very tiny tremors here, in world terms. But enough for two local men, one the postmaster, the other a shoemaker, to start keeping records of tremors as early as 1839. Anyway, off goes the ‘HBF’ up towards the Grampians, the general name for the plateau lands of the central and eastern Highlands. The boundary is actually very clear, as it forms the northern edge of Strathmore (Gaelic: big wide valley). Though the line of the Grampian hills look all but impenetrable long and lovely glens reach deep into the heartlands. 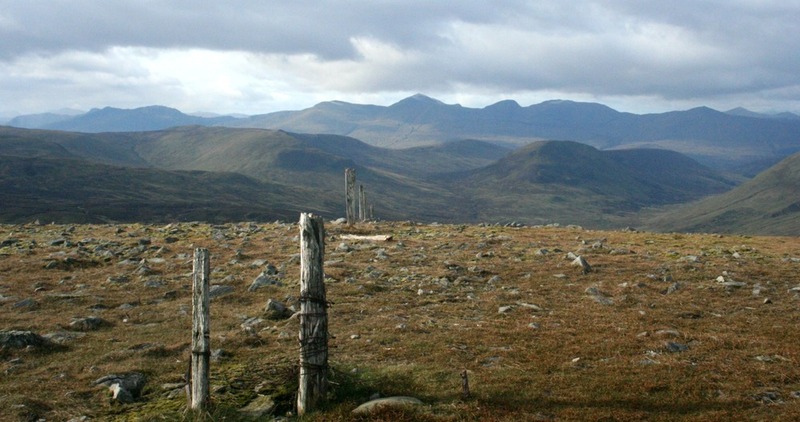 The Angus glens such as Prosen, Isla and Esk and others are worth exploring. Anyway, you get the picture. Anyone with any kind of an eye for landscape can see that the central belt of Scotland suddenly and dramatically gives way to the Highlands – at Balmaha on Loch Lomond, at Aberfoyle and Callander in the Trossachs, at Dunkeld on the A9, Blairgowrie and so on. You enter a portal and it isn’t just geology; it’s partly a cultural thing….. The Highlands – is it a cultural thing? Inland from my home town are trim farms, intensively cultivated fields, few woods and only the hints of hills, away to the west. By culture and language and even scenery then, the Highlands of Scotland are not on the coastal strip that runs north past Stonehaven (where the Highland Boundary Fault reaches the east coast). (Pictured here.) This is a ploughing match at Fordyce in Aberdeenshire. Nothing Highland at all about this picture. And the conversations between the ploughing competitors, farmers, judges and everyone else there that day would be more or less opaque to outsiders. Where are the Highlands? – are they a state of mind? However, if you are in search of the Highlands, be assured that you only have to drive west of Aberdeen for barely half an hour before it starts to ‘feel’ Highland again along the valley of the River Dee. Certainly, the old Queen Vicky thought so, as she and Albert built their retreat on Deeside – Balmoral Castle. There Victoria had her Highland fantasy, with wall-to-wall tartan furnishings and tartan-clad lackeys. So the question of where are the Highlands can be geographically answered by saying they are north of the Highland Boundary Fault as described above but, paradoxically, on the eastern edge from Aberdeen round into the Moray Firth you will find essentially a Lowland heritage. Time to pull us back to the proper Highlands then. (Pictured here) This is Kilchurn Castle and the top end of Loch Awe (which is actually Scotland's longest loch). It's pretty typical Highland scenery, though maybe you would have preferred something a little more purple with heather perhaps? It's August so there's no snow, only cloud shadows. The picture is taken from the Inveraray road and it's impossible to get the power lines out of shot. Sorry. Still, I bet you hadn't noticed till I mentioned them. Finally, from an administrative point of view, even the tier of government or ‘Local Authority’ called the Highland Council has boundaries that do not take in all of this area. The Highlands of Scotland also spill into Perth and Kinross, Stirling, and Argyll and Bute. Perhaps the real answer to the question about where the Scottish Highlands are is, basically, where it starts to look like our preconceived and learned notions of what the Highlands are, influenced by romantic ideas of the cult of the picturesque or where, historically, the clans with their separate culture, economy and allegiances, used to be found.. The Highlands of Scotland? Och, just keep driving north and you’re sure to find them!